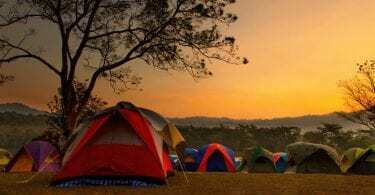 Best Pop Up Tents for the Beach | For Shade Worshippers Everywhere! Home » 6 of the Best Pop Up Tents for the Beach – For Shade Worshippers Everywhere! A trip to the beach can be one of the most enjoyable days out in my book. But if you are anything like me you have to have somewhere to escape the rays. Seriously, I once had children shout “lobster boy! lobster boy” at me as I made my way home after a long day in the sun. These days I always take a few bits of gear to make things more relaxing. And this article investigates the best pop up tents for the beach so that people like me never have to scare children with glowing red skin again. (Note: this article looks exclusively at pop up beach tents. I've written another piece that looks specifically at beach shades and canopies which you can read here). The Pacific Breeze Easyup Beach Tent weighs a little over 6lbs and folds down into a very neat 36" x 6" x 6" carry bag. When pitched, the floor space is 8' x 4' and the height is just over 4' meaning you can easily fit 3-4 people in. This is a hugely popular beach tent and rightly so! Whether you're a shade-bather like me or have kids or even a dog, this beautifully-designed tent will give you the space and sun protection that you need. I love how lightweight and compact it is (I mean, who wants to cart 100s of pounds of kit to the beach...it's a vacation, people!). It's an absolute "breeze" to put up (pardon the pun! ): you just pull on the strings and up it pops. Taking it down is easy too...you push press a pair of yellow buttons and the whole thing buckles. And excitingly, it even fits back in the bag! (How often does that happen?!). The 5 sandbags mean that the tent will easily stand up in 15-20 mph winds. (Top tip: if you take some large resealable bags, you can fill them with sand and put them in the pouches. That way, you won't have to shake out the pockets!). And if you're wanting some addition support, you can stake it out with the four stakes that come with the kit. This is a superb beach tent for couples and families. Even if you think it's too big for you, I suspect you won't regret buying it, as it really is a superb bit of beach kit. (If you really think it's too small, you might want to check out the Genji Sports Beach Tent). It weighs 7lbs and measures 8 by 8 by 5 inches. The tent has an up and down Easy Hub System. The sidewall is built-in to offer protection from harsh weather conditions. It is dog and kid-friendly. It is easy to pack and assemble. The tent comes with a big carry bag, stakes, sand pockets, and guy line. It has a warranty of one year. The tent is large enough to accommodate 4 people. The poles are sturdy and robust as they are made of hard plastic. The tent should be staked into the sand to prevent from swaying with the wind. The sand poaches should always be filled up. Cons - the tent skeleton is a little bit flimsy, the front flap has no grommets. It's an easy to set and assemble beach tent. It has a UV protective coating to block the UV rays and protect you and your family or friends. The fine mesh will help to block sand. The four sand stakes and four built-in pockets help to prevent the tent from being swayed by the wind. It is lightweight and weighs 4,8lbs. It comes with a carrying bag to help you when going outdoors. The joints should be UN-locked before you fold the legs, as this will prevent damaging them. It measures 85 by 58 by 42 inches. ​This type of tent is easy and simple to set up, thereby, this will help you to get most out of your time and make lasting memories. The tent is versatile, functional, and rugged. It is designed for an adaptable and shared experience outdoor. The tent is multifunctional and versatile. It can be used as a canopy, beach tent, camping tent, or cabana. It makes it a unique tent in the market. It is spacious, thereby accommodating your entire family. It occupies about 56sq feet surface. It is waterproof and durable because it is made of polyester Ripstop with durable zippers, thick oxford flooring, and fibreglass that is sturdy. It's a 2 in 1 sun canopy quick-up cabana style tent. ​This tent can make your camping and travel effortless. You can set it in few seconds and have a great shade. It measures 88.6 by 47.2 by 37.4 inches. It has double doors on both sides. The inner and outer zippered nylon can allow you to switch between complete privacy and high breathability. The two mesh windows on the back and front ensure that there is air circulation and the nylon flaps allow privacy. The carry bag is ideal for carrying and storing the tent. The tent also comes with a small bag for storing accessories. The tent is 100% risk-free, and satisfaction is guaranteed. There are various things to look at when buying a popup tent for the beach. (I also wrote about the best instant tents for camping here). The following are some of the factors that you should consider. It's is one of the most important things that you should consider when buying a beach tent. The material used in making the tent should be put into consideration. It will determine the durability of the beach tent. No one needs a tent that will not be used under difficult conditions. Ensure that you look at the quality of the tent that you buy. Size is another important factor of consideration when purchasing a tent. The size depends on the number of people who will be using the tent. There are different sizes available on the market. You can easily get a tent of any size that you want. When purchasing an item, the first thing that I do is maintaining the budget in which I can comply; this makes it an essential factor to consider. Pick a tent that is within your budget. Ensure that the tent gives you the value of your money. A beach tent should be easy to pack and carry around, as this is important when going out. An ideal tent should be made of a lightweight material. It should be easy to fold and pack for easier carriage. Choose a tent that has its casing or carrying bag, as this will make portability easier and simple. Ease of use is an essential factor that should be considered before you buy a pop-up beach tent. A good tent should be light and easier to carry around. Think of how easy the tent is to set up and fold down, how strong it is when setting up, where it will be used, and space it will consume when storing. It will help you to choose a tent that is user-friendly. Before you buy a tent, ensure that you consider how the tent you want to purchase is designed. For relaxing activities on the beach, a well-designed tent is essential. Choose the design that you wish to or is attractive and can meet your needs. A good beach tent should be easier and simple to assemble. Tents that are of low quality may be hard to set up when it is breezy on the beach. A simple tent can be set-up by one person. It can make you happy. Most of the popup tents are easier to put together and erect in few minutes. A good tent should be sturdy and durable for a long time. It should stand in all kinds of weather. Ensure that the tent you buy can stand in windy weather. Make sure that the tent is designed for sandy beach conditions, as it will help you to set it up easily and make it steady if it is windy. The tent you want to buy should provide additional protection other than shade. Some tents offer protection from the UV rays from the sun. The protection comes in the form of coated resources that help to block UVB and UVA rays. Protection from UV is necessary when at the beach for both adults and kids. Some beach tents are simple, and others have additional features. The features make them user-friendly. The features include cross-airing windows that can be closed for privacy, fold-down doors to trap sand, some pockets, and also sand-bag pockets that are joined. Purchase a beach tent with features that can meet your needs when using. The tent will be a great addition to the sunglasses. 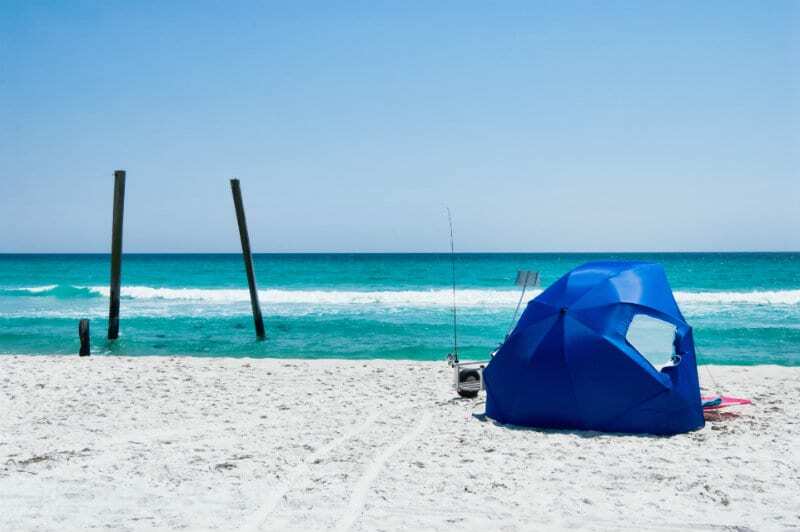 The following are some of the advantages of owning a beach tent. The tent will offer protection from harsh elements like sand, wind, rain, and harmful rays from the sun. If the weather is cold, the tent will make you feel warm. The tent will help you to protect your items when camping or on the beach. With a tent, I don’t have to worry about my things getting damaged by water. If you leave your items unwatched on the beach, there is the danger of thieves. You can shield your items and valuables in your tent. For additional privacy, you need a good tent. On the beach there is no privacy, a beach tent will offer the required additional privacy. You can comfortably relax with your friends and family in the tent. More so, you can change your swimwear comfortably. Food can be protected from the sun and sand. A good tent has a space for storing food to prevent it from spoiling. With the beach tent, the young children and babies can be protected. They will have a shady place to rest and have a nap. Young kids should not be left in direct sunlight for a long time. You can use it as a station for nappy changing. The tents can be anchored easily in ground or sand using wooden stakes. They are easy and straightforward to put up.